Info "You don't stand a chance playing against me!" 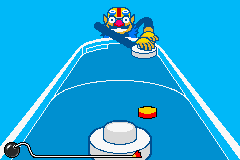 Wario Hockey is one of Wario-Man's microgames in WarioWare: Twisted! The player must use the Game Boy Advance's tilt to move a mallet and hit the puck back to Wario. Level 1: The player has to hit a puck with a normal-sized mallet. Level 2: The player has to hit a puck with a small mallet. Level 3: The player has to hit two pucks with a small mallet. There are four Souvenirs based on this game: Spitz Hockey, Ana Hockey, Unfair Hockey, and Eternal Wario Hockey. This page was last edited on September 20, 2018, at 09:41.